Pictured above: an old soda bottle works as an inexpensive cloche to protect a young seedling. 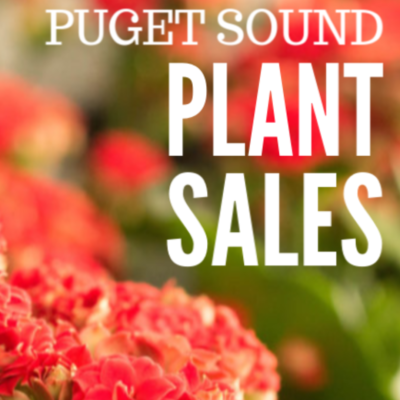 Last week, I launched a series on Frugal Gardening. Watch for new posts each Monday and Friday and an update on my own garden each Tuesday. 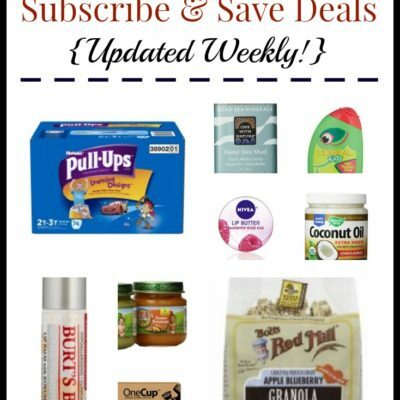 I created a Frugal Gardening page over the weekend so you can refer back to previously published posts. Today’s post is one that I’ve had on my mind for awhile now, but one of those topics that may cause a bit of upset. If you’re reading this site, chances are you care about saving money. I do too! When it comes to gardening, there are many ways one can recycle, re-purpose, and up-cycle. However, I’m seeing more ideas shared on Facebook, Pinterest, and social media forums about ways to reuse items in the garden that make me…concerned….and sometimes, just puzzled. So before I get very far into this Frugal Gardening series, I wanted to share some of what I’m seeing with you and ideas for how you can safely re-purpose items in your garden. I love that more people than ever are getting passionate and creative about growing their own food, particularly in urban and small spaces. But I’d like to raise a bit of a red flag of caution about some materials you probably don’t want growing right next to your edibles! Old tires. I don’t want to say ALL tires are bad, but I do want to caution you here. Tires as they decompose may release toxins into your soil, which is something you obviously do not want. I also question what kind of heavy pollution tires have been exposed to. While you have to make your own decision on this one, I would personally not use old tires in my garden. Old furniture/lumber. I would advise to not use pressure-treated lumber in your garden. I have seen some cute pictures of people re-purposing dressers as edible planters, but I would be concerned in some cases as to how that wood was treated, varnished, stained, painted, etc. And of course, anything that may have lead paint would be a definite no-no. If you wish to use them, consider using materials like this for growing non-edible plants. 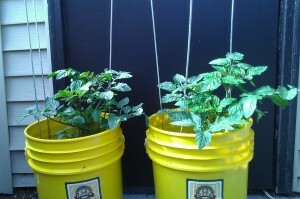 Pictured above: my pal Erica growing tomatoes in food-grade buckets she got for FREE from a local restaurant. Other dubious materials. Take some time to research about unusual materials you’d like to use as a container for your edibles. For instance, before growing herbs in an old barbecue, I’d want to know: are there harmful particles involved I should be concerned about? Do I have any other, better options for a fun, funky herb planter? I should probably mention that there are different schools of thought on the above materials and that some gardeners will argue any “leakage” of toxins is minimal or wouldn’t get into your edibles. Some people may think I’m being overly cautious here, but I’d prefer to err on the side of caution when it comes to growing food for my family. In the end, you have to do your own research and draw your own conclusions. My goal today is to put the question in your mind – is it worth it to accept those free old tires to grow your potatoes? 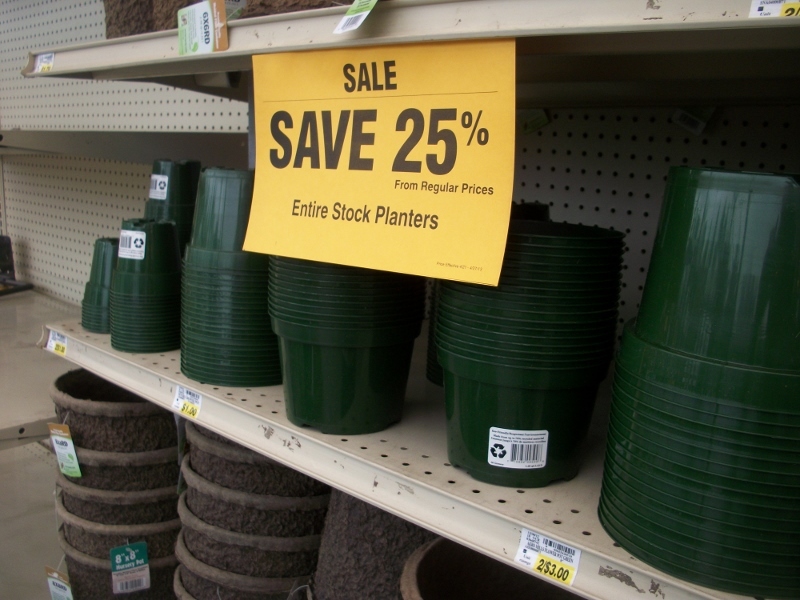 Or could you find another inexpensive solution (chicken wire or food-grade buckets, perhaps?) you can feel 100% confident about? Since we’re talking about re-purposing, I also want to suggest to you that some of the gardening ideas you’re seeing on Pinterest and elsewhere might be more cute or whimsical than practical. 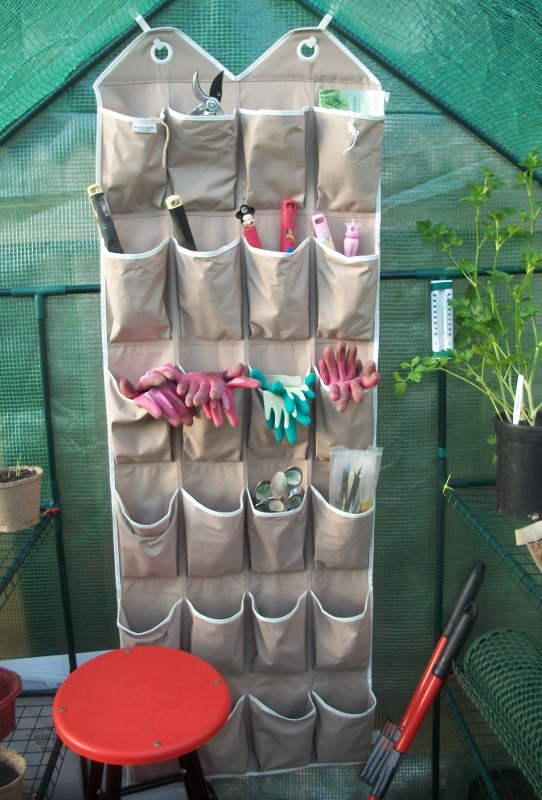 One example that comes readily to mind is growing vegetables in a shoe organizer you could hang up. The other day, I found an image being shared on Facebook like this. On the second row, someone was growing TOMATOES in this thing. Um…do you know how big tomatoes get? There is no way they are going to grow and produce in a tiny pocket. In my opinion, this is a waste of time, space, and plants. Your plants may grow in a situation like this for awhile, but there is only so big they can grow and so much they can produce. You don’t have to throw out that shoe organizer though! Check out how I re-purposed one in my greenhouse. It’s perfect for storing small garden tools, twine, plant stakes, plant markers, gloves, and more. In my opinion, you’d be better to find another free or inexpensive solution to grow your edibles. I discovered these fantastic containers at my Fred Meyer last week and currently have pumpkins, zinnias, nasturtium and cilantro germinating away in them. They are made from recycled materials and can be used over and again. 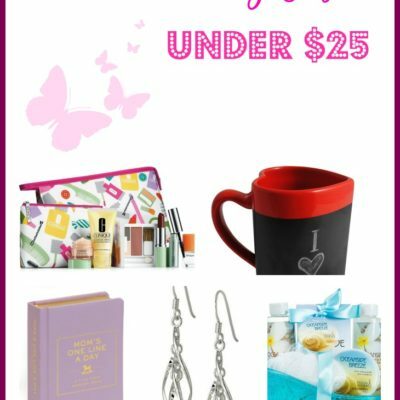 The smallest ones were just $0.50 each, and running through this week are 25% off. That’s just $0.38 per container. I truly get that some of these gardening ideas we’re seeing are experiments and perhaps even, art, but please give a little pause (particularly if you’re a brand new gardener!) to try erecting a huge hanging vertical garden of lettuce off the vaulted ceiling in your living room or growing 40 tomato plants upside down on your deck when you’ve never grown a single tomato plant before. It’s never a bad idea to start with basic, simple growing techniques first and develop your green thumb! If you are just getting your feet wet with gardening, you want some quick success to encourage you to keep going. Yeah, I get that. Truth be told, I am all for re-purposing, but when it comes to growing edibles, there is a measure of wanting to be smart about it, too! As this series progresses, I hope to share more ideas you can re-purpose in ways that make good sense for you and your edibles. When it comes to growing healthy food, I want to be successful and safe. Now, it’s your turn! 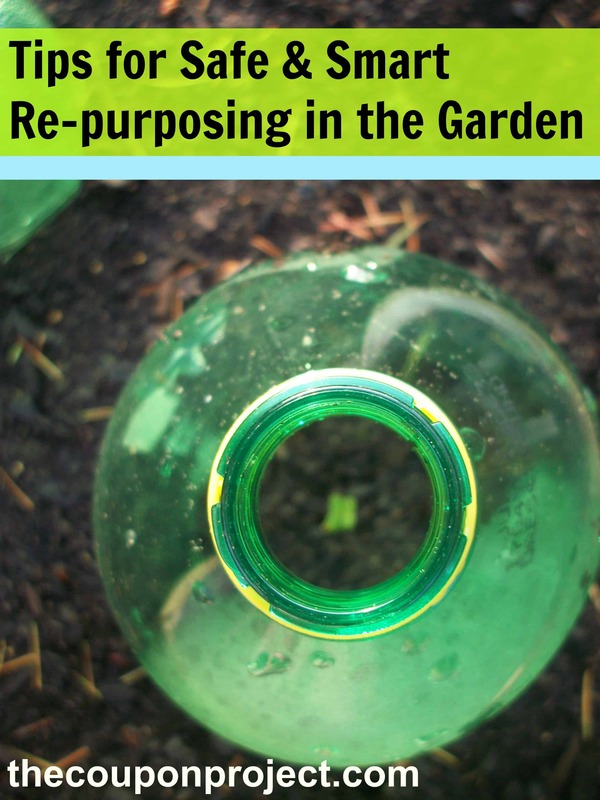 What ways have you re-purposed in your yard or garden? Do you share some of my concerns and sentiments, or disagree? I cringe every time I see someone using pallets for edible gardening. You have to be so careful about what pallets you pick and most bloggers don’t highlight that information. Many of them are sprayed repeatedly with awful chemicals to keep bugs and mold away. When they aren’t treated or are left outside past the usefulness of the treatments, they can grow harmful bacteria and fungus. I don’t want that in my garden OR as furniture. Btw, my neighbor did a dresser drawer garden and it completely fell apart after one growing season. I’m not a huge fan of pallet gardening, either. I do keep a couple in the back of my garden for yard projects, but I don’t feel they are super practical for growing food in. Great post. I am very particular about what I grow edibles in too. Currently using untreated cedar raised bed. 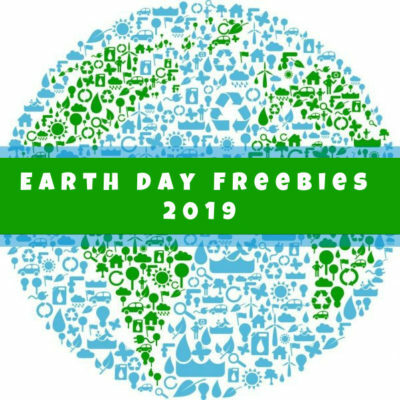 Last year I got an “eco” (drink safe, lead free @ Costco) hose to water with as well as a hose filter (Pacific Sands) to filter out chlorine and other chems in the water. If I’m going to spend the money and time growing organic edibles, might as well go all the way! Unfortunately, the hose didn’t last very long before it split and had to be replaced this spring, and my husband didn’t know that the hose filter should not dry out and removed it to wash vehicles, oops, and now I have to replace that too. I would go a step further with the storage pockets for your gloves. Think about creepy crawlies that like to hide in gloves in storage outside. I do this and add mothballs inside each pocket as a deterrent. Learned that one after a close call with a black widow!